A 2009 finalist for a ForeWord's Book of the Year Award. First published in 1999, Exile and Pride is essential to the history and future of disability politics. 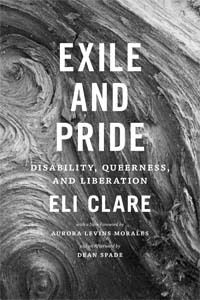 Eli Clare's revelatory writing about his experiences as a white disabled genderqueer activist/writer established him as one of the leading writers on the intersections of queerness and disability and changed the landscape of disability politics and queer liberation. With a poet's devotion to truth and an activist's demand for justice, Clare unspools the multiple histories from which our sense of self unfolds. His essays weave together memoir, history, and political thinking to explore meanings and experiences of home. Here readers will find an intersectional framework for understanding how we actually live with the daily hydraulics of oppression, power, and resistance. At the root of Clare's exploration of environmental destruction and capitalism, sexuality and institutional violence, gender and the body politic, is a call for social justice movements that are truly accessible to everyone. • Buy it from Duke University Press. • Listen to it as an audiobook from Audible.com. • Listen to the 2017 podcast "Lit Review" about the book. (Thank you Alison Kopit, Monica Trinidad, and Page May.) There is no transcript. How pleasurable it is to pick up a book that merely intrigues you because of its title and find that it is a gem well beyond its cover. This rare phenomenon happened when I came across Eli Clare’s Exile and Pride. Only a maestro of a writer can adroitly weave together her own story plus environmental, political, disability, and lesbian issues into a cohesive whole, coming out with such clarity that you find yourself identifying with many parts and muttering, ‘But of course.’ This thin volume is so thick with thought that you almost feel you have just devoured an oversized piece of key lime pie—indeed a rich treat to digest. The books that move us most are the ones that help us make sense of our experience, that take pieces of what we already know and put it together with new insights, new analysis, enabling us to form a fresh vision of ourselves and our lives. For me, Audre Lorde’s Sister Outsider and Adrienne Rich’s On Lies, Secrets, and Silence were such books, and there were significant others along the way. And now there’s Eli Clare’s Exile and Pride. Eli Clare’s original work exploring the interstices between class, environmentalism, radical gender politics, and disability consciousness moves beyond the false compartmentalization that has characterized progressive politics in the nineties, and toward a viable radical politics for the twenty-first century. Eli Clare writes with the spirit of a poet and the toughness of a construction worker. The passion and skill of her writing will draw you inside a complex life and more deeply inside yourself. Eli Clare’s Exile and Pride is a call to awareness, an exhortation for each of us to examine our connection to and alienation from our environment, our sexuality, and each other.